I’m an Italian Mamma; food is my creativity, my outlet, my gift to those I love. When the kids were small, I mastered the fine art of home made chicken nuggets. I learned to make baked macaroni and cheese. I made delicious home made soup. When they grew up, I mastered chili with green salsa, chicken parmigiana, chicken pot pie. Now, though, my babies have grown up, moved away, and established kitchens of their own. I no longer rush home to make the meals that will hold them close to me. Now I am feeding only two. The delicious pressure is gone. Now dinners are smaller and freer and easier to create. Now food is love for my first true romance, my honey, my partner, my friend. Now dinner is lamb chops or home made ravioli or locally raised beefalo steak. Food is still love, but many a night that love is made of leftovers from the night before. Pasta, pizza, pork roast, beef stew; it all heats up as a filling meal the next day. But one thing that has not changed with the advent of the empty nest is that dinner is never, ever a meal of fish or shellfish. When the kids were small, they didn’t like fish very much. As they grew, Matt learned to love shrimp, but no other seafood. Tim was allergic to shellfish, so this devoted Mamma never even considered cooking it. And the love of my life, my husband of 34 years, will eat fish if I make it, but he doesn’t enjoy it. As a good Italian Mamma, that means that I don’t ever cook it! Tonight I am at home alone. Paul is having dinner with an old friend who is struggling through a difficult time. The kids are in their own homes, making dinner for themselves. I am here, all by myself, in a house that is empty of anyone needing love or nurturing. Anyone other than me, that is. Today I went to the grocery store to fill the larder for the week. Apples and orange juice, mouthwash and wheat bread; I filled the cart with everything that we would need to get through another work week. And then I came to the fish market. And I saw the blue mussels. Tonight I made homemade wheat bread, more coarse and less sweet than what my family likes. I steamed a pound of mussels in butter, garlic and white wine, a meal that no one else would have eaten. 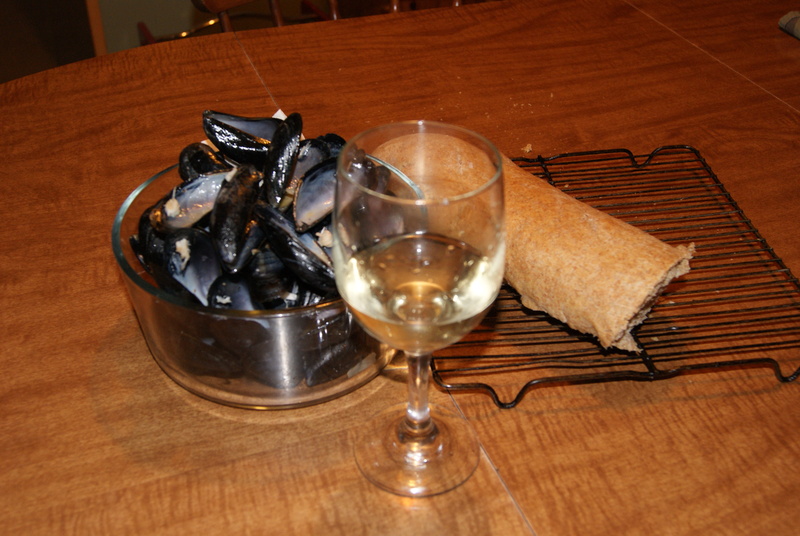 I poured myself a cold glass of white wine, dipped the hot bread into the luscious buttery broth, and popped those garlicky mussels into my own grateful mouth. Your posts always make my mouth and mind water. Deliciousness! Thank you! So glad that you came by! REALLLY good mussels, I must say….! And oh how delicious that sounds! It really was…..Yum! and so incredibly easy, too! Its so funny to see that I am beginning to enjoy little bits of this empty nest thing…! What do you cook for yourself when you’re alone? Absolutely beautiful. Your writing reminds me of what I felt like the first time I walked through a gorgeous organic market in my neighborhood in San Francisco (Village Market on 8th and California which sadly is no longer there) and how I savored the sight of the vegetables and fruits and flowers (the displays were beautiful pieces of art). . . . you just have a way of reminding me of and connecting me with everything I love. What a lovely and touching thing to say! And I really did mean to be simply writing about the joy of fish when you want some fish! I am finding it a challenge, in a good way, to learn how to simply take care of myself. Very freeing, but ultimately still sad for me. What do you mean the house is empty of anyone needing love and nurturing? The dogs are there, aren’t they? The mussels look and sound yummy. After you come for lobster at my NH house next year, I’m coming for chick parm at yours! And I am really looking forward to our shared meals!! Thanks for making me smile in my fishy smelling house tonight! I love the smell of mussels, wine, and garlic. It’s like perfume! Yum. I’ll join you for a seafood dinner anytime! Yay!!! Wild caught salmon on the grill today….! Oh. My. God. That sounds fantastic! Do you serve them with rice? Mussels are one of my favorites and I too never make them because no one in my house would eat them…new found freedoms are ours. I’m with eM, my mouth began watering when I read this. I need to eat before reading your blog. H’mmmmmm. I wonder if perchance my food obsession is why I can’t lose weight?! Thanks for coming by! You are ALWAYS invited, any old time! Those mussels were fabulous, I have to say! And as for weight loss, my new theory is this: if God wanted me thin, he wouldn’t have created chocolate. Or butter!